Zara Anishanslin is Assistant Professor of History and Art History at the University of Delaware. Her book Portrait of a Woman in Silk: Hidden Histories of the British Atlantic World was recently published by Yale University Press. At first glance, this portrait seems to send a straightforward message. It appears to be yet another example of a colonial American posing as a refined member of transatlantic British culture, signaling her gentility through the metropolitan luxury goods she wears. But the portrait visualizes more than just the likeness of a long-dead woman. And it tells more than a simple narrative of status and emulation. Rather, this thing fashioned of oil paint on a framed canvas is a revelatory object, a seemingly-typical portrait that narrates a much more complex story about global economy and individual lives and labor in an age of rising—and falling—empire. The woman in the portrait is Anne Shippen Willing (1710-91). 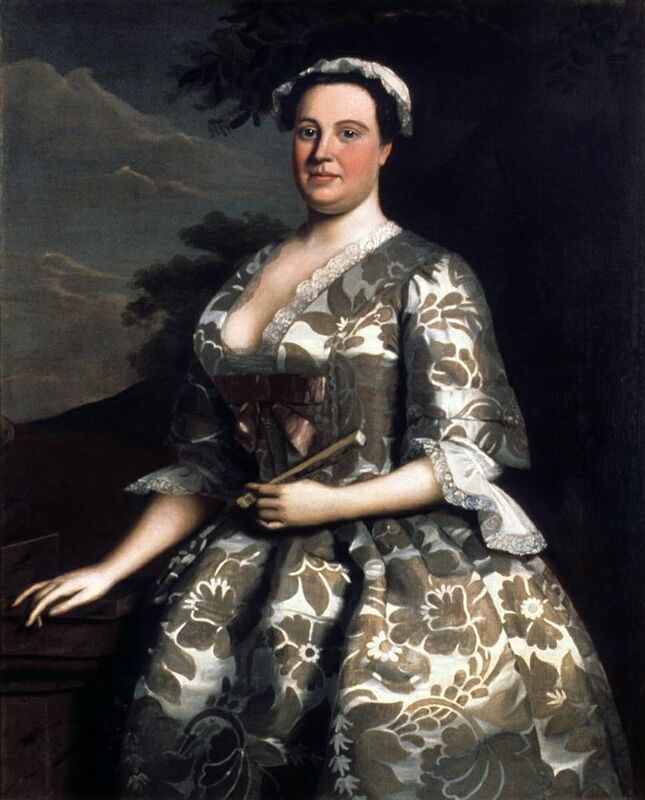 The Philadelphia-born granddaughter of Philadelphia’s first mayor, Quaker Edward Shippen and wife of merchant-mayor Charles Willing, she had given birth to six of her eleven children when she posed for this portrait in 1746. The dress she wears is made of silk designed by Londoner Anna Maria Garthwaite (1688-1763), one of early modern Britain’s few women silk designers. Garthwaite designed the bold botanical textile pattern for one of her frequent customers, master weaver Simon Julins (c. 1686/8-1778), in the summer of 1743. Within three years of the pattern’s creation, the woven silk had crossed the Atlantic to Philadelphia. There, Willing had it made into the dress she wore to sit for her portrait by Newport, Rhode Island itinerant painter Robert Feke (c. 1707-c. 1752). This 1746 portrait of a woman in silk brought these four geographically separate lives together in one object. Together, they form a transatlantic network unknown to them but no less evident to us looking back. From the mind of the designer to the hand of the weaver in London, across the Atlantic to the body of the sitter and the eye of the painter in the colonies, we can trace the creation, travel, and histories of this silk and this portrait as they were made, sold, bought, and used. But this single portrait tells us much more than simply the biography of an object, and the microhistories of this network of four. It also contains macrohistories—of thousands more people, events, and ideas—all similarly connected by things around the British Atlantic. Portrait of a Woman in Silk argues that the production, consumption, and use of commodities in the eighteenth-century British Empire created object-based communities that tied its inhabitants together, while allowing for different views of the Empire. The many histories hidden in this object—created by two women and two men, two colonials and two Londoners—lay bare a mental and material world created by women’s labor as well as men’s, and a transatlantic economy driven as much by colonial Americans as metropolitan producers. Americans were not just avid consumers but also sophisticated producers, motivated to make and buy things by political, cultural, and personal concerns far more complex than emulative refinement alone. Portrait of a Woman in Silk spans the collective lifespan of the designer, weaver, wearer, and painter who together created the single object at the heart of the book. The chronological accident of their birth and death dates means that this history of the long eighteenth century arcs from the Glorious Revolution to George Washington’s first presidency. Tracing the full life cycle of this network means that the hidden histories captured within this portrait tell tales of what wove the British Empire together, how it unraveled, and how new empires—on both sides of the Atlantic—came to be. Given this chronology, SHEARites might well be tempted to flip to the end of the book. The last section of the book focuses on the American revolutionary era from 1763-78 and includes a Coda set in 1791. The final chapter discusses the economic and political ramifications of the 1763 Treaty of Paris for silk producers and consumers on both sides of the Atlantic. Focusing on women laborers as well as men, it investigates how protestors in Britain and America alike imbued the wearing and weaving of that most symbolically luxurious of fabrics—silk—with political meaning. This interconnected history is one that encompasses both weavers’ violent protest in London’s streets and scientifically driven efforts—often spearheaded by women—to build American silk manufacture. The chapter ends in 1778, with the American Revolution well underway but hardly settled. This untraditional chronological ending point might be somewhat unsettling to historians of the early republic. But the choice was deliberate—in part to avoid the book seeming like a teleological march toward American independence. That said, one of the reasons SHEARites should find the book of interest in its entirety, rather than just its last part, is that it adds to our comprehension of how, as John Adams famously put it, “Thirteen clocks were made to strike together.” To understand this history, we must consider the clocks themselves. Chief among the arguments made in Portrait of a Woman in Silk is that not just the four people who together created this single object, but thousands more people, were connected through producing and consuming things like it. Whether they were textiles or clocks, people created both mental and material worlds—imagined communities—through making, buying, and using commodities. We are, for the most part, accustomed to thinking of early American history as regional history. We tend to emphasize differences among New England, the Mid-Atlantic, and the South; differences between systems of labor and slavery; or differences between religion and ethnicity. But from New England to the Lowcountry South, colonists shared the experience of making and buying objects like portraits and silk. Production and consumption of such things allow us to consider connections that cut across regional distinctions in early America. They also recast our traditional chronological notions about the so-called consumer revolution and the imperial marketplace, forcing us to find the roots of revolutionary era patterns of production and consumption not in the 1760s or 1740s, but as far back as the 1720s. Tracing the histories hidden within these objects illuminates the development of a shared colonial identity that might be called “American” (and indeed, at times was so labeled by colonists themselves) that predated the American Revolution by decades. A last note on why SHEARites might read Portrait of a Woman in Silk is a methodological one. The four identifiable people connected to this silk and this portrait were all literate, all financially solvent, and yet essentially unexplored by historians. Most likely this was in part because each left a very sparse trail in archival documents like letters, diaries, and probate inventories. But each did leave behind was a trove of material and visual culture. Using the things they created and used as historical evidence brought their lives out of the historical shadows. Hidden histories are bound to emerge when, instead of using material culture to answer historical questions, we make the material culture itself the question.